There are family traditions to uphold or buck, questions of geography, the common and wholly justifiable allergy to all things Steinbrenner-related. These reasons for Mets fandom must, in all cases, be paired with a willingness to choose heartbreak over the easy thrills that come with backing the effortless pin-striped alpha dogs in the Bronx. But however they came to cheer for the team, Mets fans can agree that new ace R. A. Dickey is the organization’s most interesting star since Keith Hernandez’s mustache was in its pre–Just for Men heyday. The 11-1 record and 2.31 ERA he posted through his first fifteen starts was phenomenal enough; that this monster season is coming from one of the more compelling athletes in sports makes it all the more so. Dickey famously rescued himself from the minors in his mid-thirties by learning to throw the knuckleball. Difficult to master and nearly impossible to command, it is a pitch that works, when it works—when it’s not too cold or too damp or otherwise too difficult for the knuckleballer to get a proper grip—by behaving in a way that pitches ordinarily don’t. Curveballs curve and sliders slide; the knuckleball does whatever dance it damn well pleases. Former big-league catcher Bob Uecker’s advice on how to catch it—“Wait until it stops rolling and pick it up”—remains the state of the art. In a sport where rote postgame clichés are a way of life, Dickey speaks like a character in a Charles Portis book. Add in the novelistic quality to his career—for starters, he made it to the majors despite lacking the vital ulnar collateral ligament in his throwing arm—and his story has a way of hooking you. 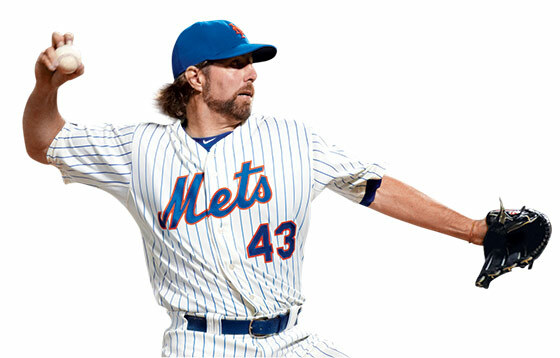 “The knuckleball is very unpredictable,” Dickey told ESPN’s Jeremy Schaap. “Although the movement is chaotic and severe, if you throw it right, it’s a beautiful thing. And that’s how I view my life.” Dickey enthusiasts would agree with that, avidly.